The Marvel Cinematic Universe continues to expand as yet another installment approaches; however, Avengers aside, this marks the first non sequel addition to the series since Captain America debuted back in 2011. 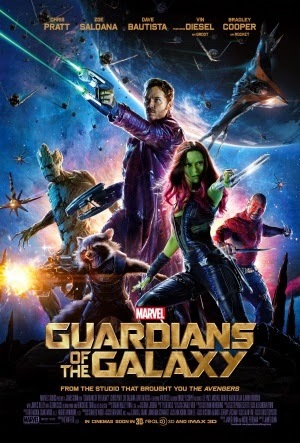 Guardians of the Galaxy unites a band of misfits who were established in the comic book namesake back in 2008, and pits them a in a battle against once the galaxies fiercest villains. Peter Quill (Chris Pratt) is a 'legendary' outlaw who dubs himself Star-Lord; after stealing an orb containing an unstoppable power, bounties are placed on his head, and the merciless Ronan the Accuser (Lee Pace) sends his daughter Gamora (Zoe Saldana) to hunt him down. The large bounties attract hunters Rocket Raccoon (Bradley Cooper) and Groot (Vin Diesel), while a mutual path for justice attracts the vengeful warrior Drax (Dave Batista). Initially intolerant of one another, the newly formed team are soon forced to unite and fight together when Ronan's villainous lust for the orb leaves the entire universe at risk of destruction. Guardians of the Galaxy is perhaps the best film in the entire MCU since Iron Man in 2008, finding a perfect balance between the embracement of its light hearted premise and the genuine emotional stakes of the story. Writer/director James Gunn has a script packed with jokes that never fail to keep the plot a likeable and fun experience; it never tries to take itself too seriously, but at the same time, the script manages to make a seemingly wacky premise an engrossing adventure that's far more than a parody of the source material. Timing is a key factor; other MCU films like Iron Man 3 and Thor: The Dark World had some decent jokes that cropped up in scenes that just didn't demand them. They fell flat as a result, but Guardians times its witty gags perfectly and as a result it's absolutely hilarious without being desperate. It's excellent humour aside, Guardians is still warm and emotional, thanks to a plethora of sweet tender moments that help us connect to this loveable lineup of characters. Of course, with such a huge budget and sci-fi premise, Guardians is also stuffed with visual magnificence, both in the CGI motion captured characters and the thrilling action scenes. The ensemble cast perform brilliantly, particularly Cooper as the ever so awesome Rocket, as well Chris Pratt as Star-Lord. Compared to the likes of Iron Man or The Winter Soldier, which contained much stronger political themes and complexity, Guardians is a tamer affair that opens up to a wider audience. It definitely benefits from such a glorious sense of fun, and proves once again that blockbusters can be light hearted and action packed and still be as awesome as more intelligent styles of film.